I had Claudia order this book five or six months ago. As she’s been stuck at home recuperating from her heart surgery she suggested I read it to her. Its quite slim. 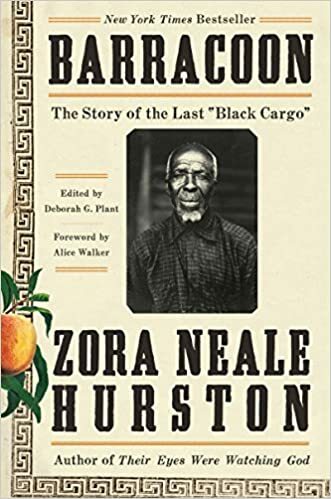 By Zora Neale Hurston, Barracoon, was completed in about 1931 but only recently published. A Barracoon was a place where African prisoners were held before being put aboard the ships of Scottish and Yankee slave traders. Hurston learned of the last living slave from the last shipment of slaves to the United States (the ship “Cudjo” was transported on ran a Civil War blockade) and went to interview him about his life. The book faithfully records his simple dialect for the sake of authenticity. It reminded me of something I have been thinking about recently. Black Americans sound different today than they did when I was a kid fifty years ago. Although a few blacks have sounded “white” since the days of house slaves; the vast majority, deprived of educations and sequestered in slave quarters, developed a distinctive patois. In the 1960’s Julian Bond was an exception with his then distinctive Middle American voice. (Here he is in 1982 making some sound observations about Socialism that would echo in the face of today’s Republican hysteria on the same subject.) Today the acting world is re pleat with black actors whose voices betray only the slightest hint of growing up in an inner city or south. I was 15 during the Selma to Montgomery March. I was 18 when I read about Stonewall in Newsweek. I visited Seneca Falls when I was about 55. BTW. Tuesday night will be the air date of the third and final installment for the American Experience program on the Abolitionists. I’ve thought about this issue a lot; far more than this short post will give any sense of. I’ll rely on Rush Limbaugh’s formulations because he is the only commentator for which any criticism by a Republican will lead to a near death experience. Ergo he must be the GOP ideal. When Barrack Obama’s nomination seemed a very distant possibility in 2007 Rush had a field day beating up Hillary Clinton by suggesting that Democrats would be too timid to attempt to nominate the truly stellar Obama. In this odd way Rush practically dared Democrats to nominate Obama and court defeat at the hands of a nation of racist voters. As an Obama supporter myself I made a mental note of this. It occurred to me that this was a not very subtle way to encourage the Democrats to do what GOP strategists wanted them to – nominate a black candidate and lose. To me the Red Plan has been much more about the practice or mispractice of democracy than anything else. If it is a great success good for Duluth. If it is a great failure the hillside will not fall into Lake Superior. This is my home and I have felt compelled to take a stand for principle’s sake but compared to a Haiti or Ache Province in Indonesia its small potatoes. Every day I read about people who have much more to worry about than we do in Duluth and this helps keep things in perspective. Its the second eye opening story I’ve read recently by John Hari. I’m excerpting a small sample so shocking that it may very well deter folks from starting at the beginning. That would be a shame because it is one of the most hopeful and distressing stories I’ve run across lately. Hopeful in showing what a few people can do when determined to make the world a better place and distressing because it shows the fragility of a good cause when it threatens the powers that be. As the meetings went on over the years, their demands for equality swelled. Why should women’s vaginas be mutilated? They screened a video of a female “circumcision” taking place for the men. One passed out; four vomited. “The rebellion just grew and grew,” Boge says. At a wedding in 2003, the bride and all her bridesmaids wore signs saying: “I am uncircumcised.” It was a Spartacus moment, and the women here weep as they remember it. I didn’t know who Janet Porter was and Vic sent me a succinct email suggesting I not watch such “kooks.” So, I just googled her. She’s a heavyweight in her bailiwick. If she’s a kook she’s being given a lot of attention. Similar Christian leaders, who know what God wants, have become heavyweights in GOP circles and have traveled to Uganda to encourage the passage of a law that would permit death sentences to be carried out against gay Ugandans. Ignoring such people only lets them grow and thrive in the dark like bread mold. As I told Vic, I feel a need to shine a flashlight on them. This map shows the relative growth in weath in the world over the past quarter century. Its from an interesting collection of maps found at this site. What happens when you buy a cell phone or a play station? A new television program will soon be showing an apparently happy polygamous family. If, one might ask, if gay marriages are OK why not marriages with multiple partners? A very thoughtful article on the why nots starting with all the men who won’t get wives. This sounds a lot like what’s happening in much of sub-saharan Africa today.